Rabat -15% Na Head First Go Ebook PDF, MOBI, EPUB. Zobacz Teraz! Go represents an attempt to improve on some weaknesses of traditional compiled programming languages. It de-emphasizes or removes error-prone language structures like class inheritance and exception handling. It features great concurrency support and automatic memory management (garbage collection).Existing Go books tend to be highly technical in nature, teaching all aspects of t he language regardless of their relevance to beginners. 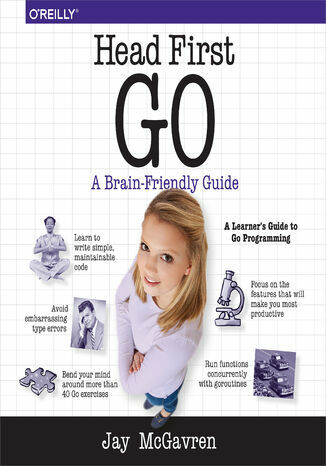 This book, rather than talking about the features of Go in abstract terms, features simple, clear examples that demonstrate Go in action, and diagrams to explain difficult concepts.This book will not only teach developers basic language features, it will get them comfortable consulting error output, documentation, and search engines to find solutions to problems. It will teach all the conventions and techniques that employers expect an entry-level Go developer to know. ISBN 9781491969502. Porównywarka cen ebooków, które dostępne są w formatach PDF, MOBI i innych. Na urządzenia Kindle i inne. Tutaj znajdziesz ebook, którego szukasz. Nie wszystkie ebooki w ofercie są darmowe. Wspierajmy autorów i kupujmy ebooki.